The camera pans back and forth between the young man and woman as they sit in the cafe and talk, their drinks growing cold as they trade barbs and niceties. At first it holds them in a neutral two-shot, afterwards panning to the left to focus on just the woman, then to the right on the man. As the conversation turns to frenzied shouts over a dead friend, the camera zooms a few feet forward, not to focus on anything specifically, but almost as if the camera were leaning in for a better look. Finally the man storms out of the cafe and the camera turns 125° to reveal a young woman furtively tapping away at her MacBook. 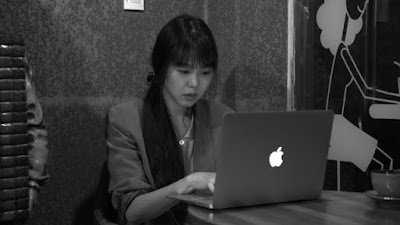 Her name is Areum (Kim Min-hee), and though she insists she is NOT a writer, she will spend the rest of the day at that coffeeshop eavesdropping on the various customers, taking quiet notes for a screenplay. Or perhaps a novel? It's difficult to say, for despite the script's intimacy, Hong Sang-soo's latest film GRASS languishes in ambiguity. As the day continues, different people pop in and out of the cafe, revealing more and more of their lives. Here's an aging stage actor pathetically begging an old female friend to let him crash in her apartment. (Later, when an old colleague begs him to move in with him, he flatly refuses.) Here's a wannabe screenwriter frustrated by writer's block asking yet another female friend to temporarily move in with him--purely to help the creative juices get flowing, of course. Later Areum becomes a character herself in these dramas as she cruelly berates her brother and his fiancée, revealing more about her own emotional hangups and anxieties than anything we learn about the other customers. By the end of the film's 66 minute runtime we feel we know more about her--and the other talkers--than they might know about themselves. But for what? GRASS is one of the most punishingly uninteresting films to screen at this year's NYFF. The problem with making a film about eavesdropping in a coffee shop is that you literally spend the entire movie eavesdropping in a coffee shop--perhaps not a bad idea if the screenplay was interesting, but in Sang-soo's rush for objective naturalism it's impossible to watch the film without getting bored. Watching GRASS is the cinematic equivalent of chewing raw tofu--perhaps good for you, but entirely flavorless.